As the leading scientific membership organization dedicated to the study of obesity, The Obesity Society connects you to indispensable scientific, educational and clinical information from an array of perspectives. As the flagship journal of The Obesity Society (TOS), Obesity features groundbreaking scientific information and cutting-edge, peer-reviewed research. You will also find reviews and commentaries representing a range of interests, ideas and viewpoints. Available in print and online, Obesity publishes vital, peer-reviewed studies and leads the field in exploring scientific developments in all areas of research, including clinical investigations, obesity biology and integrated physiology, pediatric obesity, epidemiology and genetics. You can access Obesity online any time. To view the journal’s current content, members can log in using the “Access Obesity” link at the top of the TOS home page. Non-members can view abstracts of recent articles and full text of articles older than 12 months. Having Obesity login issues? Please call 301-563-6526 or email editorial@obesity.org. Submit your research to Obesity today! Submit your best research and join the community of thought leaders in the fight against obesity. For submission instructions, read our author guidelines. Then submit your paper here. The top papers from the annual Obesity symposium will be presented during ObesityWeek each November. The papers will also be published online during ObesityWeek and in a special section of an issue of Obesity that follows the meeting. Keep an eye on the ObesityWeek website for complete details and read the winning papers from previous competitions. Obesity has published the full report of the Obesity Treatment Guidelines online. You can also order a print version of the guidelines. Jensen MD, Ryan DH, Donato KA, Apovian CM, Ard JD, Comuzzie AG, Hu FB, Hubbard VS, Jakicic JM, Kushner RF, Loria CM, Millen BE, Nonas CA, Pi-Sunyer FX, Stevens J, Stevens VJ, Wadden TA, Wolfe BM, Yanovski SZ. Guidelines (2013) for managing overweight and obesity in adults. Obesity 2014;22(S2):S1-S410. As a TOS member, you automatically receive membership in the World Obesity Federation (WOF). We are proud to partner with WOF by co-publishing the open access journal Obesity Science & Practice, as well as providing access and discounted subscriptions to other noteworthy journals published by the Federation. To receive a discounted journal subscription as a WOF member, visit the WOF journals page and follow one of the “subscribe as a member” links. 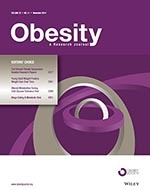 Obesity Reviews is a highly-cited journal that publishes reviews from many obesity-related disciplines. The journal organizes “for-and-against” reviews on current controversial topics. Articles are of particular interest to endocrinologists, cardiologists, gastroenterologists, obstetricians and rheumatologists, as well as health professionals working in general medicine and surgery. This international peer-reviewed journal publishes high-quality translational and clinical research papers. Clinical Obesity also features reviews focused on obesity and its comorbidities.